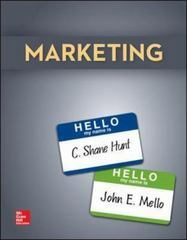 Marketing 1 Edition Marketing by C. Shane Hunt and John E. Mello was designed to demonstrate to students the connection between marketing and their future careers, whether students choose to pursue a major in marketing or another field. With a number of features to support this effort, including career tips in every chapter and a comprehensive marketing plan exercise that focuses on marketing the most important product in students' lives: themselves, Marketing is the most practical content available for the Principles of Marketing course. Supported by results-driven technology in McGraw-Hill's Connect Marketing and a focused table of contents covering all of the foundational topics in fourteen concise chapters, Marketing is the smart choice for instructors and students to adopt for the Principles of Marketing course.